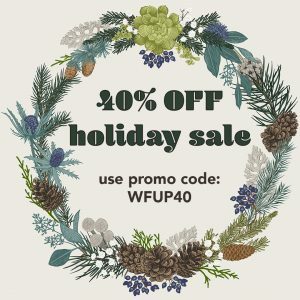 It's the WFU Press Holiday Sale! Home › News › It’s the WFU Press Holiday Sale! Looking for a meaningful gift for friends or family this year? We’re pleased to once again offer 40% off our books through the holiday season. To take advantage of the sale, order through our website (or call us at 336.758.5448), and enter the code “WFUP40” when you check out. The sale applies to books, broadsides, and t-shirts. Be sure to order by December 15 to guarantee the books reach your doorstep in time for Christmas. We hope you’ll take advantage of the sale while it lasts. We have many unique gift options, like poetry broadsides, t-shirts, and rare and collectible books you won’t find anywhere but WFU Press. If you’re looking for an ongoing gift, a WFU Press Book Club membership is a wonderful way to treat someone throughout the year.